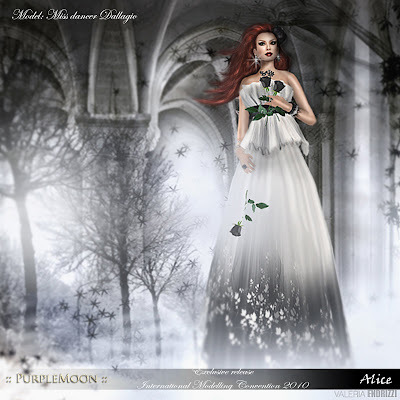 Romantic "Alice" | ! *PurpleMoon Creations* ! "Alice"; exclusive release for The International Modelling Convention 2010 is finally available at Main Store! This romantic gown has been made in soft delicate colors featuring a sculpted top with a black belt and double layer skirt with a gradient shade thats goes from a sof color to black. Many delicate flowers float at the end of the skirt on multiple layers. Alice comes in Blak & White, the opposite version in White & Black, and it also comes in Black & Lilac, Black & Champagne and Black & Sky Blue.